What Happens when Workers are locked Into their Place of Work? You Be the Judge II Lesson Five: What happens when workers are locked into their place of work? Does the law have protections for workers to prevent them from enduring accessibly harsh conditions? 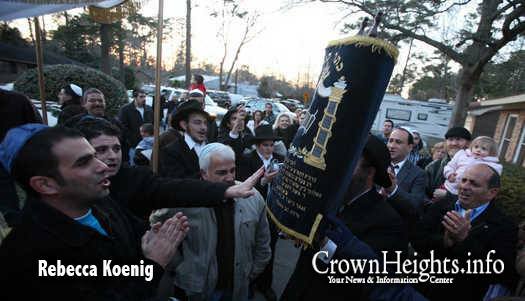 MYRTLE BEACH, SC — The first Sefer Torah in the Myrtle Beach area was completed Tuesday evening in the home of Rabbi Doron Aizenman of the Chabad Academy. A Sefer Torah, a scroll handwritten entirely in Hebrew, was started a year ago by the the Chabad Academy. Much of the work was completed by professional scribes, but the final words were written with help from members of the Chabad. BROOKLYN, NY — In the aftermath of Rabbi and Mrs. Gavriel and Rivka Holtzberg’s murders last November, the grieving Jewish community was intent on learning everything they could about the lives of these two heroes. Those of their colleagues who knew them personally shared their memories with their fellow Chabad representatives in every corner of the globe. OXFORD, UK — International relations came to the front door of Oxford University’s Chabad Society as several pro-Palestinian demonstrators launched a loud protest on the busy thoroughfare of George Street Friday night. Waving flags, handing out leaflets and raising their voices at passersby, the group objected to the appearance of veteran Israeli diplomat Yehuda Avner at the inaugural Shabbaton of campus-based Chabad-Lubavitch centers in the United Kingdom. PARIS [EJP] — Rabbis to discuss assimilation, ‘greatest threat to the Jews’. Around 300 rabbis from across Europe and Israel will attend a 3-day conference in Paris to discuss assimilation, anti-Semitism and various other issues. The conference, organized by the Rabbinical Centre of Europe (RCE) will open on tomorrow in the French capital in the presence of the two chief rabbis of Israel, Rabbi Shlomo Amar and Rabbi Yona Metzger. MOSCOW [Interfax] — Special bakery in Istra not far from Moscow completed baking matzo to Pesach, which the Jews celebrate from April 9 to April 15 this year. Thousands of children will be gathering to launch a Mivtza Hiskashrus in preparation for the Rebbes 108th birthday. Thursday, Tes Adar, 1:00 PM EST Merkos Linyonei Chinuch and Tzivos Hashem H.Q, will join forces with Chabad schools across the globe for an online children’s rally, uniting thousands of Hashem’s soldiers for an all out attack of Torah Teffilah and Tzedokoh. Rabbi and Mrs Yishayahu and Shira Rose of Crown Heights will IYH be moving on Shlichus to Toronto, Canada where they will establish a new Chabad on Campus facility to serve the students and faculty at the University of Toronto (U of T). The new Shluchim were appointed by Shliach Rabbi Nechemia Deitsch from Chabad of Midtown Toronto. Thanks for the help and guidance of head Shliach to Ontario Rabbi Zalman A. Grossbaum and to everyone who helped make this possible. Also special thanks to the Rohr On Campus Initiative. CrownHeights.info wishes the new Shluchim, a Hatzlocha Rabba on their Shlichus! When word got out Saturday night of the shocking loss of Levi Yitzchok Wolowick, administrators of Yeshiva Darchei Torah, where he was a fourth grader, had to prepare their staff and their students to deal with his death. Rabbi Dovid Morgenstern, the menahel of the fourth and fifth grades, himself a trained grief counselor, said the yeshiva immediately sought guidance from Chai Lifeline’s bereavement and crisis intervention team, led by Dr. Norman Blumenthal and Mrs. Zahava Farbman. Blumenthal met that night with administrators and teachers, Rabbi Morgenstern said. The next night “we had a meeting…in the yeshiva for parents specifically of the fourth grade,” though it was open for all who wished to attend. When school resumed on Tuesday following the snow storm, Dr. Blumenthal, a psychologist, and Mrs. Farbman, a licensed clinical social worker, planned to spend the day at Darchei offering counseling. Mrs. Daniela Gabay (Montreal, Canada) is sitting Shiva after the passing of her dear mother Itto Shabba Shemtov OBM. The Levaya will take place today, Wednesday, in Jerusalem at 10:00am (Israel Time). BROOKLYN HEIGHTS, Brooklyn [CHI] — For the fifth time in less then six months Cong. B’nai Avraham in Brooklyn Heights has been burglarized, doors and locks have been damaged, and a total of $30 in cash has been taken. More in the Extended Article.